Recently I was at a going away party for a friend who earned her horticultural dream job out in Portland OR. As a horticulturist, in a region just full of them, there were many of us in attendance. Quickly after arriving, I knew this was my kind of party. We were sitting around and someone mentioned a ‘horticultural bucket list’. Yes! These are my people! Of course I have a horticultural bucket list. When I said this, the person looked at me and asked if I have ever travelled some place just to see a plant. This got me reminiscing about my Easter trip this year designed specifically to check off something on my horticultural bucket list. For the three day Easter weekend, a special someone and I travelled down to Johns Island, SC to see the Angel Oak. Do you know it? Have you been? The Tree Sized Branches of the Angel Oak. I first learned about the Angel Oak years ago where I found a postcard of it in a small SC gas station/bait shop that also sold cassette tapes and wine on the way down to Florida. I was immediately intrigued and knew I had to get there to see this tree. Sadly it was two hours in the wrong direction and so my visit would have to wait. I am unabashedly a tree-hugger, seeking out (the largest) trees in the area wherever I go. And actually hugging them. And so destination Angel Oak became a goal of mine, in the works for a few years. Each time a coastal storm barreled up the Carolinas I cringed, worried the Angel Oak would be no more. But, like the last 400+ years, it remained strong and sturdy. Finally, an adequate amount of days, a couple of friends in the region to visit and an adventurous* travel partner presented themselves and we were off! Of course, I managed to squeeze in an additional horticultural destination along the way. Duke Gardens in Durham, NC proved a popular spot on Easter weekend, but we could still find quiet places to sit and enjoy the ferns unfurling and the bright spring blooms. This garden of Duke University is free to visit and filled with everything from colorful formal gardens to the subdued wonder of native woodlands. A seemingly bashful fern readying for another season. The pale yellow, hot pink and orange of ‘Millie Mac’ Rhododendron austrinum. Striking purple and gold of an iris along the pond. And the sculpture in the garden by Patrick Dougherty was fun to explore. The Angel Oak Tree is estimated to be in excess of 400-500 years old, stands 66.5 ft (20 m) tall, measures 28 ft (8.5 m) in circumference, and produces shade that covers 17,200 square feet (1,600 m2). From tip to tip Its longest branch distance is 187 ft.
And here I am, nearly 6′ tall with a 6′ wingspan, hugging the Angel Oak. Luckily, despite a lot of rules (in verse) designed to ensure the tree lives as long as possible, you are allowed to (gently) hug this tree. This tree is majestic and worthy of a road trip designed solely around basking in the shade of its sinewy branches covered with moss and resurrection ferns. The branches of this tree are so heavy in some cases, they are being supported through various contraptions. Looking for the variety of cabling and supports was like a scavenger hunt. In addition to admiring the tree and the engineering going into supporting it, because of my excellent and eye opening lessons in the doctoral program in Adult Education and Lifelong Learning at Penn State, I could not help but think about the history of this oak. I often pass large trees and wonder about the stories these trees could tell if we could understand their language. But I have never, before this time, considered the horrific history, large trees like this one, in the south would share as they played significant roles in the plight of African Americans in the American South. While I certainly am in no position to speak to this, I highly recommend this assumption busting article in Orion Magazine “What Hangs on Trees” by Glenis Redmond, to anyone, but especially if you find solace in the presence of trees as I do. Now there is not much written about the history of this oak in the county park that surrounds this tree. It is named for the family that used to own the property. And so I do not know the history of this tree, and like all other trees, the Angel Oak is keeping its secrets safe within the bark and branches and leaves. But I could not help but contemplate the role of trees in history and the value of trees to our existence and shed a tear during a somber moment of contemplation and appreciation. As I reflected on this tree and its story and my journey to finally get here I was brought back to smiling by the people around the tree. It was surprising how many people made this tree a destination. It was impossible to get a picture of the tree without a person in it. It was great to be a part of the excitement of witnessing this specimen. Families gathered beneath its boughs. Countless selfies with arms not near long enough to capture the tree were taken. What is it about a large tree that gathers the masses? These pictures do not do this tree any justice. You must see it in person. After all according to some accounts it may be the oldest living thing east of the Mississippi River. Plan a road trip just to see it. Of course there are many many horticultural destinations in the Carolinas and along the way but time did not allow for exploration of them on this trip. But food and drink were necessities and so we stopped into some great places along the way. Be sure to make Charlotte, North Carolina a stop on the way down like we did and check out Craft Tasting Room and Growler Shop. Purchase some baked goods from Sugar Queen Baking Company that will go well with one of the many beers they have on tap. While in Charlotte be sure to look for the street art. And while on your way back from the Angel Oak, after contemplating all that a 400+ year old life form should get you to contemplate about the world and our place in it, stop in to Low Tide Brewing Company for an excellent beer at a beautiful bar. Sure, as a horticulturist, I may be uniquely inclined to have a horticultural bucket list and to plan a road trip just to see a tree, but we all pass trees every day. I encourage you to take a second and marvel at these wonders – whether 400+ years old and enormous or a brand new street tree – take a moment to think about its story and appreciate its value – and maybe even give it a hug (people will look at you funny, but it’s okay – at least this time you will know exactly why!). *Adventurous = willing to travel hundreds of miles over 3 days specifically to visit a tree he never heard of with a person he has never driven any significant distance with. Even if that means eating pounds of trail mix (minus almonds) to sustain himself while stuck in highway traffic and eating Wegman’s sushi on a bench outside the store when not much else is around. Categories: Plants and Art, Reflection, Road Trip! 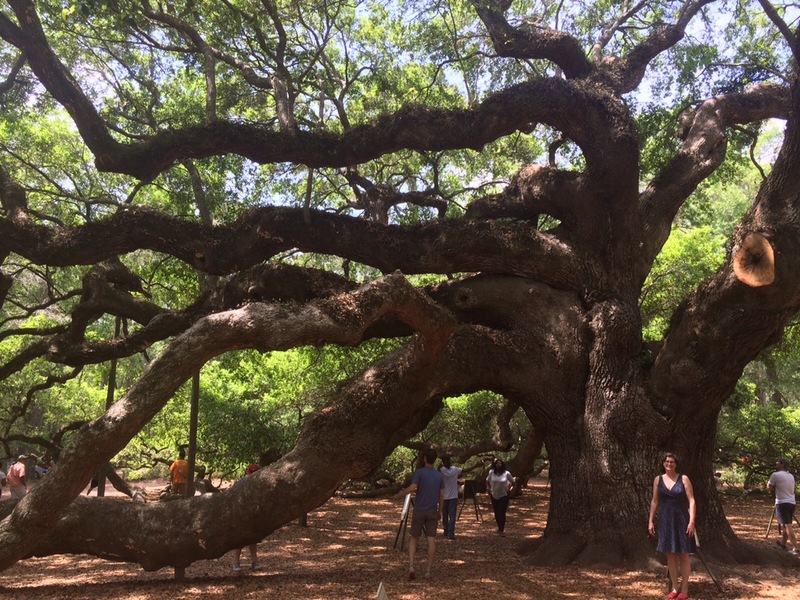 | Tags: Angel Oak, Johns Island SC, Live Oak, Road Trip! | Permalink.